Sorry i haven't been around for a few days, been busy and had a cold. It was mine and Mr P's 3rd anniversary on the 19th February, so we went to The Comedy Store as we both love comedy. We have both been once before on a news night. With the Comedy Store booked up, there was not a lot of room and it was hot, but the laughs keep you going. The Comedy Store is a first class great night out with mates or partner. You will not be able to hold your laughs in. The guys and girls are great. If you have a good crowd, it helps the atmosphere if you shout things out when they ask for ideas. If you have ever seen the TV show Whose Line Is It Anyway and love it, then come down and see the Comedy Players because it's just like the show would be. 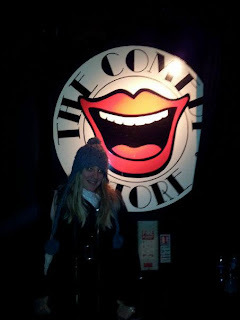 I would 100% go again - don't miss out the laughter and come down to The Comedy Store London!